Cornelis Damen Rietwijck (c. 1590-1660) Portrait painter. 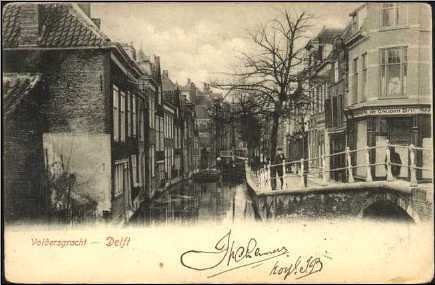 In Delft Guild in 1638, afterwards repeatedly headman. Cornelis Damen Rietwijck (c. 1590-1660) Portrait painter. In Guild in 1638, afterwards repeatedly headman. He lived on th south side of Rietveld in 1627 and 1632, but on Verwersdijk in 1630. In 1640 he bought a house for 1400 guilders on Voldersgracht number 20, just west of the Oude Mannenhuis (Old Mens House). He operated a drawing school there in 1650, still teaching there a year before his death in 1659. One of his students was Nicolaas van Roon (______-_____). Left goods worth 1172 and paintings and gear worth 180 guilders. In 1661 his widow sold this house for 3350 guilders. GAD Huizenprotocol III 674. GAD Beydals collection. Verwersdijk in Soutendam Necrologium p. 7. Montias 1982 p. 169, 174, 334. Montias 1993, p. 122. Internet archives show he married in 1636. GAD Camer van Charitate, Duijt op de gulden, no. 128, fol. 16-v. He buys a house for 1,400 f. (30 January 1640, NA 1725) ; Private communication by Montias, 2000. RKD, Bredius archive, artist folder, citing 28 Dec. 1623 in which 3 parties sold the Rietveld house. Also 5 Jan. 1661. 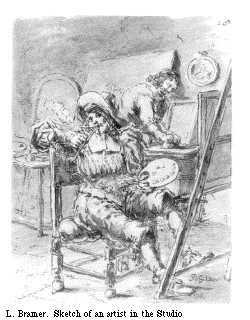 On 4 Feb. 1657 he bequeaths his prints, drawings and plasters to his brother-in-law Daen Willems Quidoucen.